I have a problem...when it comes to model cars, my favorites are dragsters...all kinds: stockers, fuelers, altereds... I don't care. 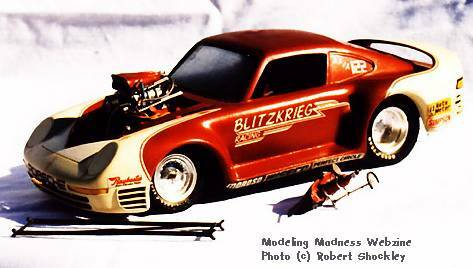 My problems lies in that I prefer to build in 1/16th scale, and as you might know, there just aren't that many proper drag-related 1/16th kits out there, not counting Revell's line of dragsters and Funny Cars. There are a lot of kits in this scale available, but they tend to be foreign exotic-cars. What's a guy to do? You kit-bash em! I began w/ Fujimi's totally excellent (and very expensive) 1988 Porsche 959 and Revell's Micky Thompson's "Revelleader" Funny Car. All body seams were filled, including attaching the rear wing, and blending that in as well, so that the 959 would have the correct appearance of being a one-piece fibreglass body. I left the hood as is, so that the engine could be serviced w/ the body down. The interior door panels were covered in sheet styrene, and blended in as well. Scratch-built hinges were mounted under the rear wing, and a support "thingie" was placed under the lip of the front edge of the hood, to hold the body up when in the raised position. The chassis is a combination of both kits. The Porsche body pan was used, though I had to hack-on and re-position the rear half to make room for the tires and rear end. It has an aerodynamic flat undersurface (no frame rails) that made installing the engine and cage very easy. I simply used the funny car frame and mounted it directly on the body pan, adding a ton of extra bracing from plastic rod to properly "fill-out" the interior. Custom tubing had to be added to the rear of the funny car frame to properly position the tires and differential within the rear wheel well. A small cut was made in the body pan to make room for the headers and the oil pan. The Porsche independant front suspension was dumped in favor of the straight front axle from the funny car. Obviously, zoomie-style headers were never gonna fit, so I used the headers off a 427 from a scrapped Ford Cobra roadster (same scale), w/ scratch-built collectors added on. The rear tires came from MPC's old "SuperCharger" blown-hemi 74 (?) Dodge. The Revell slicks are nice and spongy, but were too high to fit under the body. I liked the Porcshe instrument cluster enough to hack it off the rest of the dash and make a custom dash w/ the cluster now centered on the funny car frame. I finished her off by mixing up some home-brewed candy-apple red paint w/ white scallops, and the interior was finished in a mix of gloss black & jade green. Lettering was done w/ stencils and stick-on style decals, with a couple of coats of clear gloss layed on. That's about it...time to go Racing! !